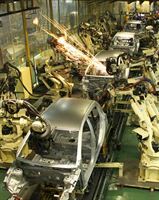 August 1, 2013 – Hyundai Motor Company, South Korea's largest automaker, reports its domestic and overseas sales results for July 2013. July 1, 2013 – Hyundai Motor Company, South Korea's largest automaker, reports its domestic and overseas sales results for June 2013. June 3, 2013 (Seoul, Korea) Hyundai Motor Company, South Korea's largest automaker, reports its domestic and overseas sales results for May 2013. · Hyundai prepares for full-time presence at iconic race track · €5,5 million facility will increase capacity for vehicle testing · Construction of purpose-built test centre to be completed by August 2013Offenbach, 31 May 2013 Hyundai is undertaking final preparations ahead of moving into its new vehicle test centre located at the iconic Nürburgring track in Germany. The purpose-built facility will be a permanent base at the track for the company, providing a dedicated resource for evaluating its vehicles on what is widely recognised as the toughest such circuit in the world.